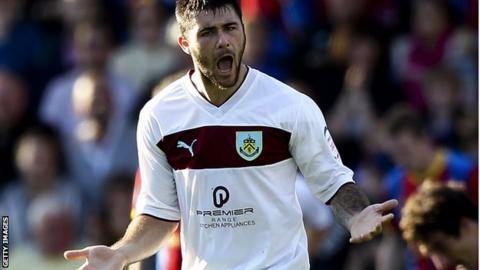 Charlie Austin's 16th goal of the season earned bragging rights for managerless Burnley over Lancashire rivals Blackpool in the Championship. The Clarets striker headed in Kieran Trippier's cross after 19 minutes. Blackpool were denied an equaliser when home keeper Lee Grant produced a magnificent double-save to deny Alex Baptiste and Gary Taylor-Fletcher. Burnley, in their first match without recently-departed boss Eddie Howe, held on for their first win in five games. In-form Austin, 23, further enhanced his growing reputation by becoming the match-winner with a remarkable 11th goal in his last six league matches. It was another worrying result for Tangerines boss Ian Holloway who, after denying speculation linking him with the vacant Blackburn job, watched his side slip to a fourth defeat in their last five games. But he will be ruing Blackpool's misfortune as Grant's heroics prevented an almost certain second-half equaliser at Turf Moor. The goalkeeper, who had barely been called into action during the previous hour of action, flung himself low to the right to somehow tip Baptiste's header on to his post. Then, he quickly leapt up to block Taylor-Fletcher's prodded follow up from close range. Victory helped Burnley move up to 15th position, just two points behind 12th-placed Blackpool. "It's been a very good day. One of the best days I've had for a long time. "To be fair I felt quite calm - I just tried to emphasise what we trying to do. You can't do too much in four days, but we've got something to build on now. "We had to weather the storm but credit to the players, they dug in and deserved the win. "Charlie Austin's goalscoring record over the last few weeks is second to none. But it's not just the goals, he's a fantastic team player." "Charlie Austin won them the game. That's what goals are all about. "Take that out of it and I would have been delighted, especially second half with the way we played. It's a shame we didn't have that brightness in the first half. "But Grant produced a fantastic double save. If we got that goal you don't know what would have happened. "We agreed a fee first for Austin and he chose them. And we've been punished."